*Back-Back Installation Low-set Home as pictured in the diagram, more options are listed on the home page for detailed quote. WARNING As of January 2019 the Electrical Safety Office of QLD has changed the regulations (AS/NZS 3000:2007) for installing air conditioning systems. All air conditioning units no matter the KW’s must have a dedicated circuit back to the switchboard with its own RCD breaker $250 incl gst. *Back-Back Installation high-set Home, more options are listed on the home page for detailed quote. WARNING As of January 2019 the Electrical Safety Office of QLD has changed the regulations (AS/NZS 3000:2007) for installing air conditioning systems. All air conditioning units no matter the KW’s must have a dedicated circuit back to the switchboard with its own RCD breaker $250 incl gst. 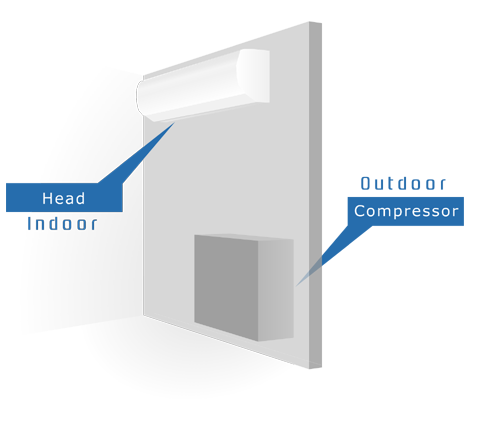 *Back-Back Installation low-set Home, where an existing unit has to be removed for installation of a new system. WARNING If existing power is not suitable then the correct procedures must be taken including costs to meet the new regulations (AS/NZS 3000:2007). This will be quoted and charged accordingly on the day separate from the cost listed above for installation. Costs involved are a guide if required, new circuit back to the switchboard with own RCD breaker $250 incl gst, new isolator switch $95 incl gst, or installation of an RCD Breaker $95 incl gst. Any existing electrical work must be brought to the relevant Australian Standards 2019. *Back-Back Installation high-set Home, where an existing unit has to be removed for installation of a new system. WARNING If existing power is not suitable then the correct procedures must be taken including costs to meet the new regulations (AS/NZS 3000:2007). This will be quoted and charged accordingly on the day separate from the cost listed above for installation. Costs involved are a guide if required, new circuit back to the switchboard with own RCD breaker $250 incl gst, new isolator switch $95 incl gst, or installation of an RCD Breaker $95 incl gst. Any existing electrical work must be brought to the relevant Australian Standards 2019. *^For a more accurate installation figure you will need to discuss your particular situation with us. Terms and Conditions apply. Prices are stated in Australian dollars & Include GST. Prices subject to change without notice. Pipe work installed through the ceiling cavity where a standard installation (back 2 back) is not possible, this is priced at $35 per meter + the initial installation on the standard split systems above. A water pump may also be required if the indoor unit cannot drain through an external wall e.g. installed on an internal wall of the home. Surface mounted electrical conduit 10mm when required if no ceiling or wall cavity is available to run the electrical circuit to the switchboard, most common in apartments. This is charged at $20 per meter. Surface mounted electrical grey conduit 20mm installed on external walls if required at $20 per meter. Extra pipe work and electrical over standard installs in duct $50.00 per meter. Extra pipe work and electrical over standard installs exposed ie, saddled under floor or through ceiling cavity $35.00 per meter. Installations on internal walls ie, pipe work going through ceiling cavity, an additional $100.00 on top of the standard back-back prices. For extra runs beyond a standard installation up to 3m. Left hand end mount $100.00. Units of 8.1kw and over require to be on 4mm mains cable additional $100 standard 15 meters. For a more accurate installation figure you will need to discuss your particular situation with us.